Home Beers Genesee Brewing Co. / Dundee Brewing Co.
Genesee Bock Beer | Genesee Brewing Co. / Dundee Brewing Co.
Our take on the 16th century German legend has turned out to be a legend in its own right. For every spring since 1951, our brewery has carefully crafted and lagered Genesee Bock Beer. The result is an exceptionally hearty, full-flavored beer with a slight malty finish—and a perfect way to celebrate the snow melt. Makes me feel young again. I didn't think they made this any more. Back in my college days this was THE beer. It was said to only be made when the barrels were cleaned. What a treat to find it again. I had some Genessee beer a few months ago, also something from my younger days, but it didn't hold up to my memories. This bock beer has exceeded my memories. It holds up to almost any beer I have ever come across - and there have been many. I could truly recommend this beer. Also, quite affordable. Please try and enjoy - in moderation. Now where is the Holland Brand in the white bottles? This is one of Genesee's best offerings. A Straight forward beer that drinks like an Amber lager. Tastes of light caramel, slight cereal grain, and a mild hop bitterness. It is a Well rounded great session beer - especially at the price point (on draft in upstate NY was $3.25). I'm a big Genesee fan, but I have to say, this really surpasses their usual standards. Who knew they could make such a great beer? I picked it up on a whim, and I'm already halfway through my second 12er. For a budget level beer, it's really exceptional, and can hold its own well above many of the mediocre craft brewers flooding the market today. with a faint wafting herbal hop on the rear. brew. Mind blowing, no, but it is a session worthy little brew. I picked up a 12 pack just to try it (it was cheap, I like cheap beer). I had no expectations, no knowledge of the beer prior to purchase. What a nice surprise! Very tasty brew. Goes down smooth. Light, clean finish. I'll buy again. A spring staple for me. All of my ratings are made with price point in mind. Considering that I can get this for $13.50/case, this is a really drinkable and a pleasing bock for me. Of course it doesn't hold up against other craft bocks but again, for the price, I really enjoy the couple cases a year I buy of this in the spring. If you're looking for a good "lawnmower Bock", this is your beer. T - Really nice caramel malt with a hint of chocolate. A bit of peppery spice on the front of the tongue and some acidity on the sides. Hops are understated but not out of line with the style. O - A beer lover's alternative to Shiner Bock. Not quite as poundable but plenty refreshing and flavorful. Stands up well to calamari; I'd also happily pair with a lightly battered fish and chips or wings. Well done, Genny! Aroma and flavor is malts, mild fruit and a relatively clean/mildly sweet finish. Comparing it to craft examples isn't fair but it was pretty decent. 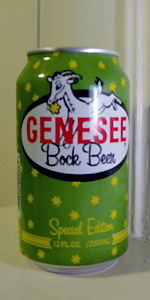 Genesee Bock Beer from Genesee Brewing Co. / Dundee Brewing Co.